This recipe for appetizer meatballs is made with a tangy red wine sauce. These tasty meatballs can also be served as a main dish. Serve them with hot cooked rice or noodles and your family's favorite veggies. The meatballs are served hot from the slow cooker, making them an excellent appetizer for a home party, tailgating, or a potluck event. The recipe is easily doubled for a crowd. Combine all meatball ingredients. Mix well and shape into 1-inch meatballs. Place in a large shallow baking dish; bake at 400 F for 15 minutes. In a saucepan whisk the cornstarch and water. Add the bouillon cubes or beef base, red wine, garlic powder, onion powder, and 1/8 teaspoon of pepper. Cook, stirring constantly, over medium heat until thickened. Add salt to taste, if necessary. Combine the meatballs and sauce in a chafing dish or slow cooker and set it on low or warm for serving. 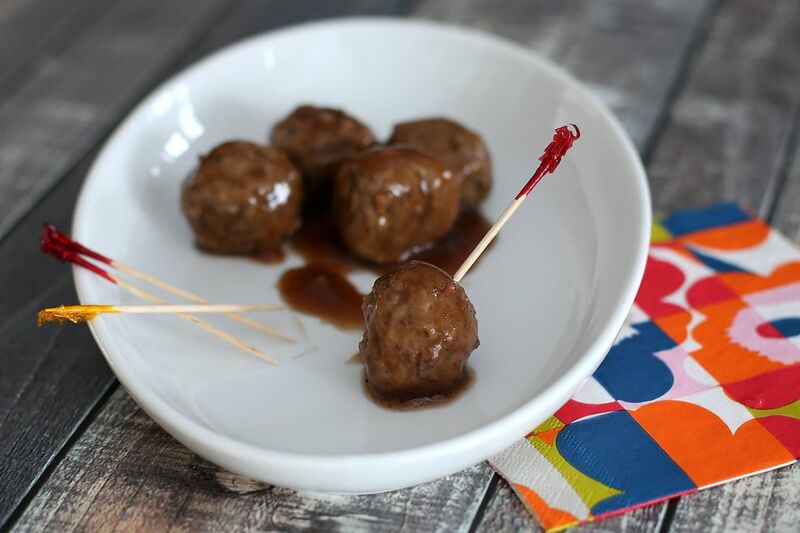 Serve the meatballs with toothpicks and provide small plates with napkins for the guests. Skip the meatball ingredients and baking instructions and use a good quality frozen meatball in the recipe. Add them to the sauce and cook them in the slow cooker on high for about 1 1/2 hours before serving. Reduce the slow cooker setting to low for serving. Bake the meatballs and the sauce the day before the party. Refrigerate them in separate containers. About an hour before the party, put everything in the slow cooker with the setting on high. Stir to coat the meatballs with the sauce. Reduce the setting to low for serving.